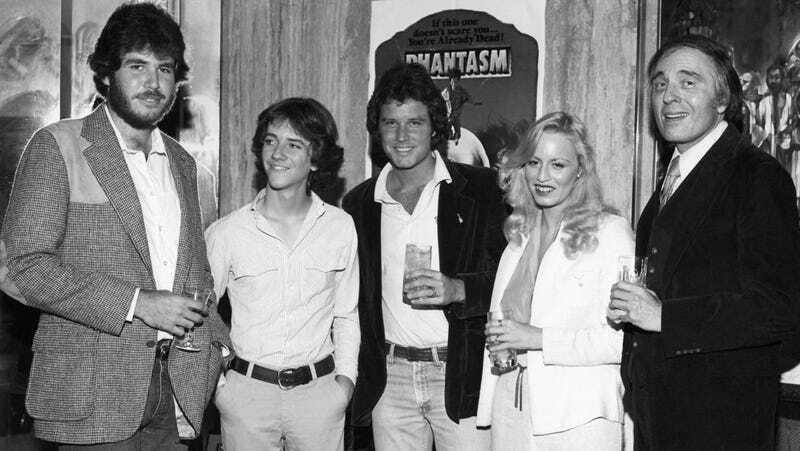 Don Coscarelli (far left) and the cast of 1979's Phantasm toasting the movie’s success. Director Don Coscarelli—beloved by genre fans for directing films like Phantasm, The Beastmaster, and Bubba Ho-Tep—is now a memoirist, thanks to a brand-new book that looks back on a wild, colorful, four-decade career in Hollywood’s indie trenches. As you might expect from a memoir written by a movie-biz veteran, True Indie: Life and Death in Filmmaking is packed with behind-the-scenes photos and anecdotes and even some dirt (Ever wondered why The Beastmaster is, well, the way it is? The whole story is revealed.). The book also offers up tips for aspiring filmmakers, some of which are condensed in a short chapter titled “Don Coscarelli’s Five-Minute Film School” (including, but not limited to, “Life is simply too short to work with assholes”). And you can finally stop asking Coscarelli if a Bubba Ho-Tep sequel with Bruce Campbell is ever going to happen; the explanation is in the book, but the short answer is “Elvis has left the building.” Noooo! After tearing through the pages of True Indie, we got Coscarelli on the phone to ask him more about the book—and how he views his cult-heavy career so far. io9: Phantasm: Remastered was released two years ago, as was the fifth film in the series, Phantasm: Ravager. What made you want to focus on your memoir as your next project? Don Coscarelli: I’d had a couple of different solicitations from publishers—and at first it was more about doing something fictional. I’d read books that other horror directors had written, like Wes Craven and Guillermo del Toro, and I thought, “That’d be interesting!” You know, they say at a certain point in your career you have to start looking for the exit strategy. [Laughs.] My mother was a published author—actually, one of her books was best-selling, and that was really a great family triumph that stuck with me. So I talked to a couple of different people about doing fiction, and then was approached by the editors at St. Martin’s who had just had massive success with Bruce Campbell’s memoir. And, of course, I kept instructing him that I would never be able to sell as many books as Bruce Campbell [laughs], but I might be able to make an interesting memoir, maybe. I kept putting him off, but one week I sat down and started thinking about what I went through. I never have been that self-reflective; I’ve really been more focused on getting that next movie going. And sometimes I just had ignored or forgotten some of the experiences I had, but when I started to put them down I realized that there were some possibly instructional experiences for aspiring filmmakers—and then I started writing about that experience with Universal Pictures [with 1976's Jim the World’s Greatest, Coscarelli’s debut feature], and I realized what a unique situation myself and my filmmaking partner Craig [Mitchell] at the time had, and it just became fun to tell the story that way. io9: Growing up in LA in the 1970s, so close to all of the things that were happening in Hollywood at the time, as you describe in the book—that was really the perfect time and place for you to find your way into filmmaking. Coscarelli: It really was. Looking back on it, I think one of the things that makes the book really interesting is just the nature of the timing of when I grew up. When we went into Universal, it was almost like a change was starting to happen in the industry. Over my career I witnessed a lot of changing technology; when we first started making movies, we were using almost the exact same techniques and even cameras that Buster Keaton and Fatty Arbuckle had used. It was also a different time in terms of the kind of filmmakers that I was watching and the way that people responded to them. It was a real time of transition, and I thought people might find that interesting. Behind the scenes of 1998's Phantasm IV: Oblivion. io9: Other than the huge advances in technology—digital cameras, easy access to editing software, and so on—what do you think has changed the most for young filmmakers starting out today? Coscarelli: Access to audiences. A couple of keystrokes, and a million people can see your work, if there’s interest. That part of it’s amazing. But also, I can’t believe I used to make movies without cell phones. I mean, can you imagine? Literally, when we made Phantasm, we’d be out shooting at this warehouse, and if you forgot to bring something, and somebody was on the road and you wanted to get ahold of them, you’d have to call every place they might be going to on the way. I just don’t know how we did it back then. Those kind of things are crazy. No email, and all of that! But now, you can fix anything on your laptop pretty easily with just a little education. So it’s a great time to be making films, I would expect. Although the sad part about it—and I don’t want this to sound strange, but I guess I’ll just go and say it—is that even back when DVDs became popular, and people were making their films 10 or 20 years ago, you could go through a stack of 10 aspiring filmmakers’ work, and not every one would be great. Maybe 10 percent would be worth looking at. It’s probably the same thing now, but it’s just that so many more people are making them. And that was another part of why I wanted to write the book, because I was able to explore some of the things I think about. Like those numbers at Sundance, where they get like 10,000 submissions and they only take 150 films—there’s 9,500 independent filmmakers who are basically doomed to never having their films seen. Every one of those invested effort and hard-earned money in making movies. Those are things that I think about that don’t necessarily get covered in the mainstream press. io9: True Indie covers your experiences both good and bad—the chapter on the making of The Beastmaster, which gets into how you ended up losing a lot of control over your own film, is particularly harrowing. Coscarelli: Look, there were some setbacks in my career, and those setbacks...you just never forget. There were some capricious decisions made by people—and I don’t know what their intentions were, really, but at the time that just impacted me so negatively. And worse than just me, in my opinion, they damaged the movie. See, that’s the thing about being a film director is that you get so much damn credit. “Your movie, Don’s movie,” and all of that. Truthfully, there’s so much creative collaboration that goes into making a movie. I welcome taking all the credit, but wow, when you’re in a bad situation and someone else is making creative decisions, creative interference, and then, for the rest of perpetuity, that movie is credited to you? [Laughs.] You know, you’re gonna remember those stories. io9: Most people know you through films like Phantasm, The Beastmaster, and Bubba Ho-Tep, but reading your book, you actually started out making straightforward drama films. Is that a realm you’ve ever wanted to get back to? Coscarelli: All the time. I have a wide variety of interests, but only a narrow window that I’m really allowed to practice. It’s been a frustration because of course I can do a genre movie, then I’ll develop a couple of projects, usually including another genre movie to protect myself, but I’ll always try to do things that are different. I’d love to do a straight-up comedy someday, or a World War II movie, or a character study. When I grew up, the slice-of-life movies of the 1970s were so wonderful, like The Last Picture Show and Five Easy Pieces. I’d love to try to make something like that, but I don’t know where I’d get the funding. Bruce Campbell takes five in his Elvis costume on the set of Bubba Ho-Tep. But that’s not to say that I don’t love working in genre. Horror’s not so bad—I can express myself, and hopefully make something interesting, and there’s also the potential to make some good money. So, it’s a strange little life that I’ve led, but the cool part is that I enjoy it. I think if you look at my movies, you’ll see that as I’ve gotten older, I’ve tried to go a little farther afield in terms of what is genre is, especially with Bubba Ho-Tep and John Dies at the End. It’s not the traditional stuff, so something a little different within genre, is usually what I’m trying to aim for. io9: It’s a bit of a double-edged sword being a cult filmmaker, I guess. It’s cool in a lot of ways, but it also limits you. Coscarelli: Well, yeah. But you know the thing is, I always equate the word “cult” with passion, and there’s nothing wrong with people being passionate about stuff. Nowadays, of course, he’s more of a mainstream star, but Bruce Campbell used to tell this story that would always get me going: “I can walk down a line of 100 people and 99 of them won’t know who I am. But that last person in line will wet themselves.” [Laughs] I always thought, “Wow, you did have an impact, but it’s just on a small cult of passionate people.” So that’s cool! The Beastmaster at the Chinese Theatre on Hollywood Boulevard. True Indie: Life and Death in Filmmaking is out October 2; you can pre-order it here. For information on his book tour—which will include screenings of Phantasm: Remastered and Bubba Ho-Tep along the way—go here.